Today's post is late because I spent the day at a yard sale. 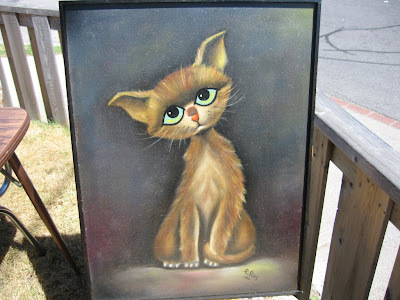 One interesting item that turned up at this sale was a painting of a cat. It was painted in 1973 by Robert H. Ray, whom I can't find any trace of on Google or Wikipedia, so hopefully I didn't lose out on millions today. Mr. Ray sold this painting to a relative of mine, who was his friend in Ohio. Unfortunately, this painting was stored improperly and had developed some mold on the surface. I thought it was ruined, but figured it couldn't get worse if I wrecked it by fixing it. I didn't take a "before" picture but you can see that I was able to completely erase the mold spots; it turns out they were just on the surface and a damp cloth restored this painting to its original beauty. Unfortunately, it seemed even a restored kitty wasn't going to sell this day. The painting sat on its chair all morning and all afternoon, the cat staring longingly at the passers-by. Something about the cat compelled me, and I dismayed that we would never find it a good home. Personally I liked everything about the painting but the cat's eyes, which appear flat and unnatural compared to the soft tone of the rest of the piece. The cat and I waited, while people bought other items, and the day wore on. About 20 minutes before it was time to close up, a man walked up the street carrying his dry-cleaning. As he came closer and closer his face lit up and grew brighter and brighter. When he saw the price he was literally beaming. We wrapped up the painting and he was on his way. As he passed by one of the tables another gem caught his eye: a wind-up penguin that poops candy. He bought that for 10 cents as well. Another happy customer. Posted by Mr. Shiny and New at 6/23/2007 08:48:00 p.m.